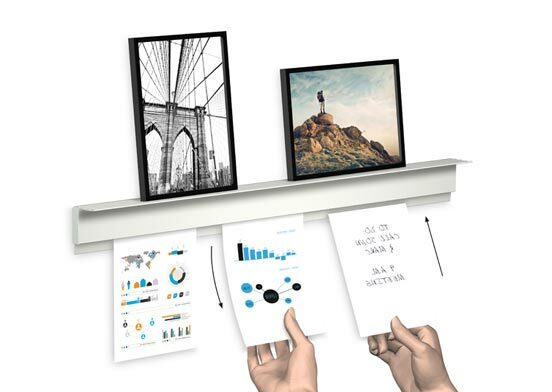 Display It is a presentation system that allows you to showcase documents, posters or photos in a fun and eye-catching way. 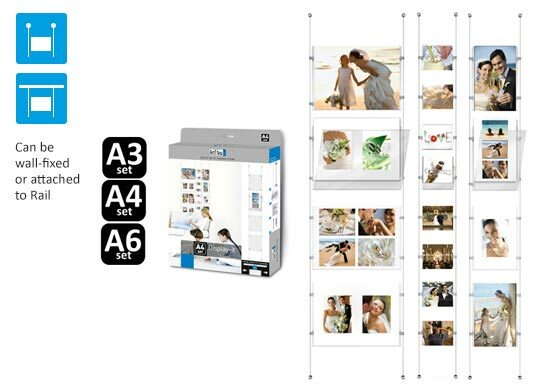 It is possible to combine frames of different sizes and create a sleek photo wall using the Display It Economy sets. 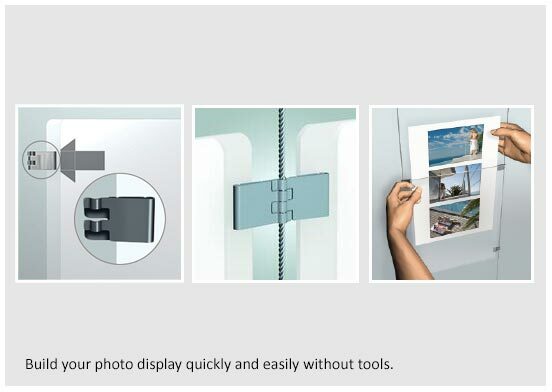 The Display It system can either be wall mounted or hung on our flexible picture hanging rails. Economy sets come in three sizes: A3 (4 x horizontal acrylic holders, 4 x e-clips per holder, 2 x steel cables), A4 (4 x vertical holders, 4 x e-clips per holder, 2 x cables) and A6 (6 x horizontal holders, 2 x e-clips per holder, 2 x cables). 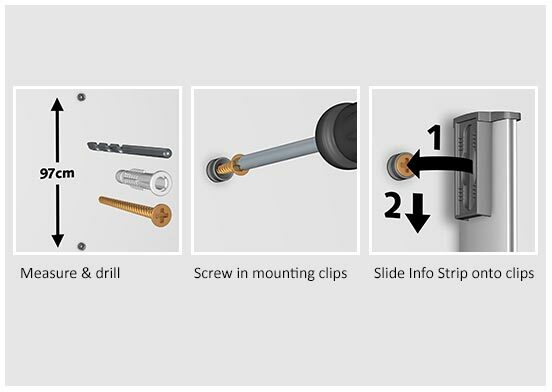 The E-clip allows you to change pieces quickly and easily and link extra columns without tools. Acrylic holders can be linked either vertically or horizontally, allowing countless combinations. Can be tensioned between surfaces with the addition of a Flex Tension Cable Set or a Fixed Tension Cable Set. For displaying oversize pieces or mounts between 3-6mm thick, try our Display It Solo kit. If you have pictures printed on dibond, aluminium or acrylic plates, the Display It Solo kit is the best way to hang them. 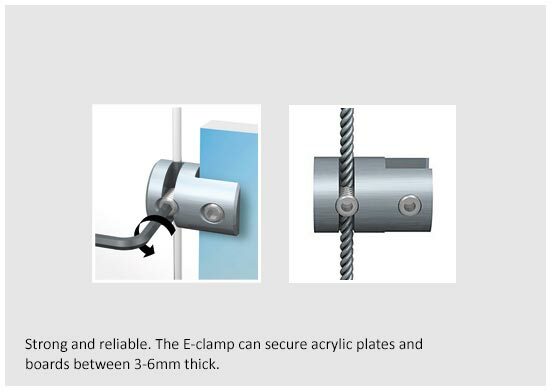 The four clamps can hold plates or board between 3-6mm thick and make it easy to change pictures quickly without the need for extra tools. Like the Display It system, the Display It Solo kit can either be wall mounted or hung on our flexible picture hanging rails. Good for displaying oversized pictures and plates between 3-6mm thick. Set comes with 4 x clamps and 2 x nylon hangers for a strong, yet streamlined, look. Holds up to 10kg. 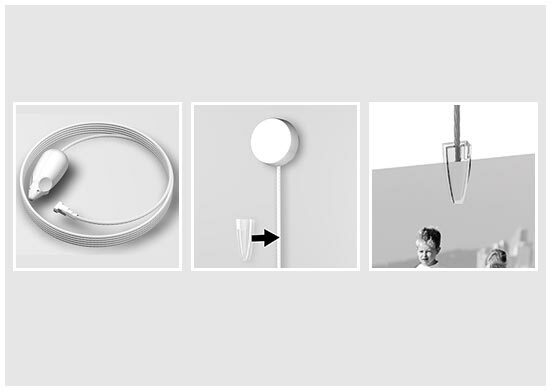 Hangers have Twister heads which can be kept inside the wall-mount buttons and fixed to the wall or attached to an existing rail system. 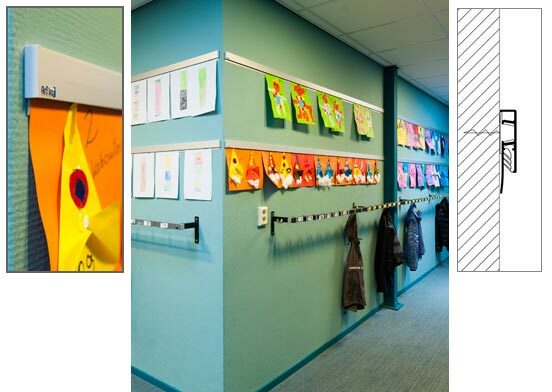 The Info Rail is an ideal tool to share information in offices and open spaces. 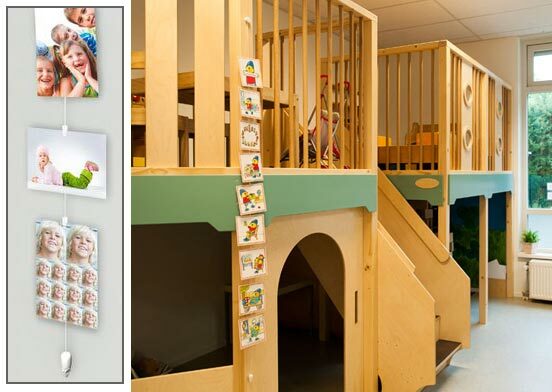 The rail can be used to suspend all types of documents from children’s artwork to recipes. The 3-fold gripping system guarentees a firm suspension of documents (from paper more than 80gms to cardboard up to 2mm thick) whilst still making it easy to change displays. Perfect for classrooms. The rail comes in four different lengths but can be easily cut to correct size. 3-fold gripping system ensures a firm hold on documents up to 2mm in thickness. 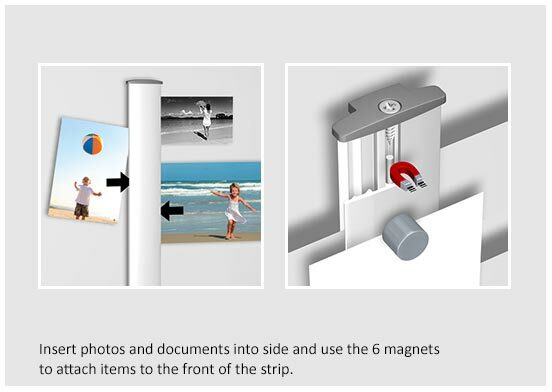 The Info Strip is a hanging system for documents such as cards, photos and drawings; a handy way to collect and display documents. Pieces can either be slid into both sides of the aluminium strip or magnets can be used to attach items to the front. The easiest way to share information in a one-metre space! 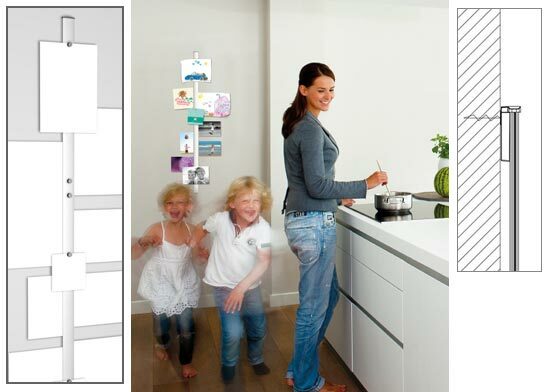 The Info Strip is a sleek aluminium strip that is one metre (100 cm) long. The Info Strip is mounted vertically to the wall by clicking the rail onto 2 clips. 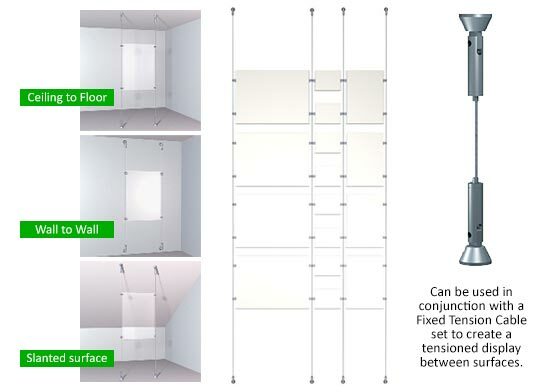 Takes up very little space, making it easy to mount on narrow sections of wall in a variety of locations in a home or office. Picture Mouse Solo is a fun and unique way to display photos, postcards and other small documents. 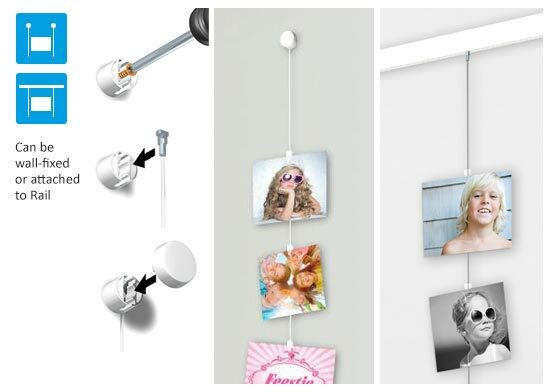 Used as an alternative to traditional photo frames, the plastic clips make it quick and simple to change out any image whilst the hanging cord makes the most of available wall space by letting photos hang in a single column. Great for kids’ rooms and kitchens. 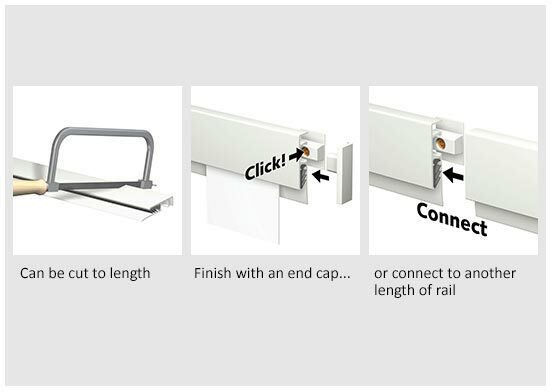 Picture Mouse Solo can be either wall mounted or attached to any of our rail systems. Use as a fun and eay-to-use alternative to traditional photo frames. Set comes with plastic clips to attach photos to the steel cord. Cute ‘mouse’ weight keeps hanging cord straight. 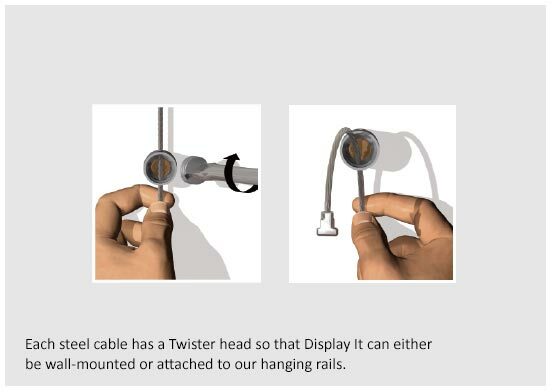 The steel cord has a Twister head which can be attached to an existing rail system, or kept inside the wall-mount button when attached to the wall. The Whiteboard Set has been specially developed to ensure it may be hung in an easy, flexible manner in combination with a hanging rail. The set consists of 4 clamps which must be affixed to the back of the whiteboard. The steel wire cords are threaded through the clamps and tightened, and may then be mounted to a hanging rail. The clamps ensure that the whiteboard is stable when mounted to the wall. 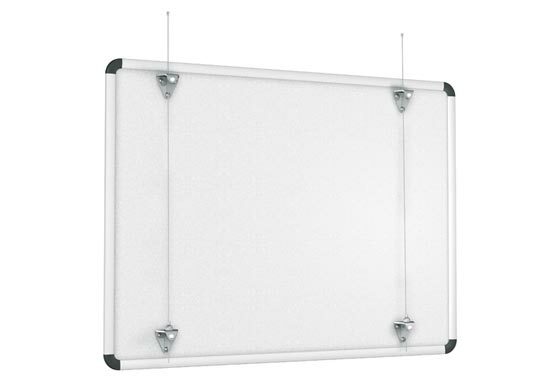 Thanks to the combination of the whiteboard set and the hanging rail, it is extremely easy to adjust the height of the whiteboard and/or to hang it horizontally. The Whiteboard Set may be used in combination with the picture hanging systems Top Rail, Art Strip, Click Rail, Click Rail Pro, Deco Rail and Combi Rail Pro Light. 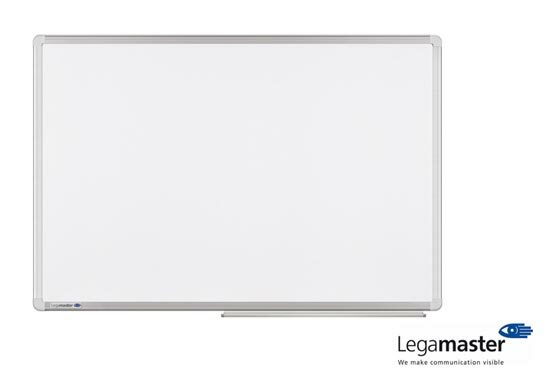 We also offer whiteboards high-quality whiteboards. In our product offering you can also find professional presentation products such as Whiteboards. We have selected the high quality products from Legamaster. With 60 years of experience, Legamaster is the pioneer in digital presentation and professional presentation products. Next to Whiteboards, we offer Glassboards in different colours as well as Textile Boards. For more Legamaster models and products, please contact Mosaic Gallery . The most important part of a whiteboard is the surface. Choose a surface made from enamelled steel, lacquered steel or melamine, depending on how you plan to use the whiteboard (long-term/intensive basis, long-term/regular basis, or regular basis). You also have the option of a magnetic surface. The most important part of a whiteboard is the surface. Choose a surface made from enamelled steel, lacquered steel or melamine, depending on how you plan to use the whiteboard (long-term/intensive basis, long-term/regular basis, or regular basis). You also have the option of a magnetic surface. The Mosaic Gallery Whiteboardset has been developed with easy, flexible wall mounting in mind, and may be used in combination with our hanging rails. The Info Rail+ combines the advantages of the Info Rail with the possibility to display interior design accessories such as photo frames or books. 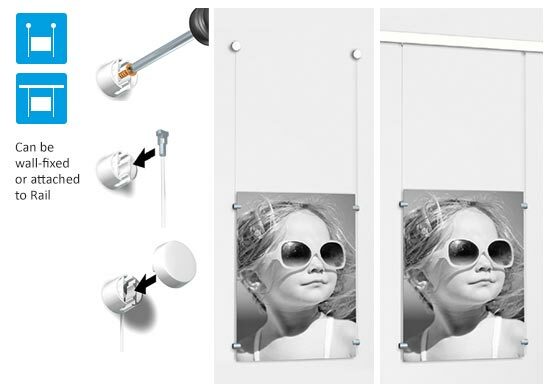 This display system is a sleek, original addition to the wall and in your interior. It’s easy to slide documents such as photos, recipes, drawings and posters into the rail. You can also display objects at the same height on the extra shelf at the top of the rail. You can change the contents you display on the Info Rail+ as often as you like , and this is just one of the many advantages this original display system offers in a room. 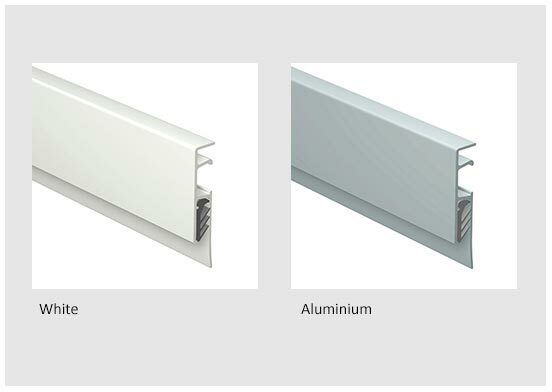 Depending on the style of your interior, you have the choice of an Info Rail+ in white or aluminium. 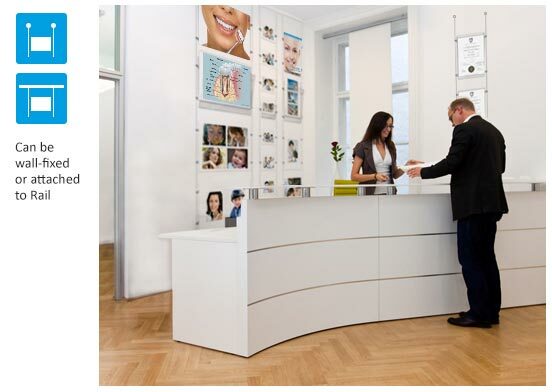 This display system is also available in two lengths, 100 and 200 cm. Clips are used to mount the rail to the wall. After the clips have been mounted at the right height, the Info Rail+ is simply clicked onto the clips. This makes the mounting of the rail to the wall extremely strong and reliable.